We at FAR try to not only help meet the basic needs of children though our programs, but to also nurture their potential. 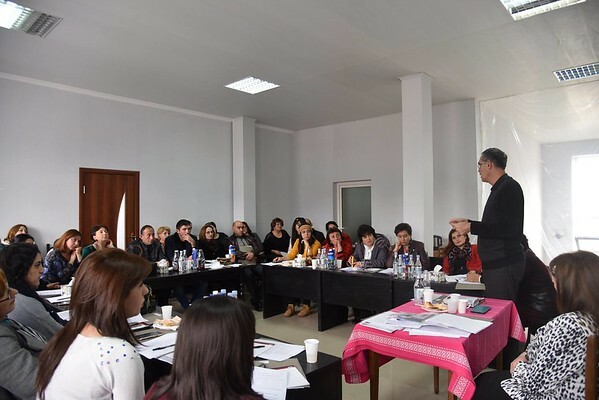 With this in mind, our own Eduard Karapetyan, FAR’s Education and Science Programs Manager, initiated a day-long training for the staff of our Breaking the Cycle of Poverty Program (BCPP), specifically its extracurricular group teachers and social workers. The main message of the November 23rd seminar was to underline the importance of fostering a strong connection between extracurricular supervisors, parents, and the community as a holistic way to benefit the child. Staff from local schools were also invited to participate. BCPP funds more than 14 extracurricular activity groups and four Sunday schools in Tavush’s Berd Region. A total of about 580 students are enrolled in these various groups, which ultimately aim to fight child poverty by igniting children’s interest in the arts and by boosting their confidence. However, simply offering such groups to the community does not necessarily effectively reach the children who might need them the most. “The parent should have input into his/her kid’s development. However, I have witnessed the scenario when we’ve asked for some financial contribution from parents. When they couldn’t afford it, the student had to leave the hobby group,” said Armine Arzumanyan, a teacher from Tavush Village who runs a painting group supported by FAR. The training also called on schools and municipal government to support such cases when families have little financial means. A portion of the training also focused on ways to help families develop a household budget. But the issue often extends beyond money. While parents in many rural communities can’t invest in their kids’ development due to financial issues, there is also often a reluctance from parents to involve their children in extracurricular activities. “It also has to do with mentality and psychology, even if FAR supports the groups through the provision of materials,” added Armine. Supervisors learned techniques on how to plan and organize events (exhibitions, concerts, performances, etc.) as ways to further integrate parental participation into their work, and as a way to ultimately make their projects more effective in the long-run. “Our goal today is to make sure that you are headed in the right direction. We should combine our efforts to reveal the talent of the child and to collaborate with the parents, and the community to enhance his/her abilities. Your goal is to stand by the kid, whereas our job is to organize and track the children’s developmental progress,” said Eduard. The seminar was organized with collaboration from the National Institute of Education.